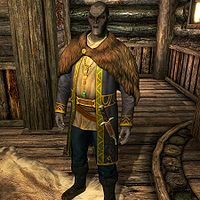 Indaryn is a Dunmer warrior that Maven Black-Briar has appointed to run the Black-Briar Meadery in Riften. He is merely a puppet for Maven and not really allowed to make decisions on her behalf and, as a result, Indaryn struggles to keep his questionable staff in line. During Under the Table you can choose to help him find out who is selling Black-Briar Mead behind his back. Indaryn also seems to have fallen under the promiscuous spell of Haelga, an indiscretion to which you will have him confess during the quest Caught Red Handed. Indaryn has a room on the second floor of the Meadery where he sleeps from midnight to 6am. He starts the day with a one-hour breakfast at the neighboring Bee and Barb then works the Meadery for twelve solid hours, either looking after his employees from the balcony above the vats, or helping out on the ground floor. At 7pm he returns to the Bee and Barb where he stays until his bedtime at midnight. Indaryn wears a set of fine clothes and a pair of fine boots. He is equipped with a leveled dagger which can be up to elven quality, and he carries a key to the meadery, as well as a selection of common items and gold. 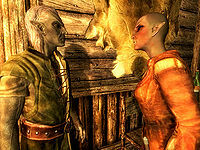 Indaryn: "Why don't they listen to me, Keerava? Why won't they do as I say?" Keerava: "Maybe they're afraid of you. Maybe it's your breath. How should I know?" Indaryn: "They always try to take advantage of me. Give them an inch and they'll take a mile." Keerava: "I'll tell you one thing, if you don't make peace with them soon you may get a walkout on your hands. Then we're both in trouble." "The Dreth family doesn't steal, Indaryn." 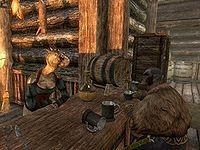 Indaryn's accusations towards Romlyn Dreth turn out to be true, as he illegally sells Black-Briar Mead to innkeepers and customers all over Skyrim, right under the nose of his employer. When asked if he sells cheap mead, he will proudly explain: "No, no friend. You've got it all wrong. I'm not selling cheap mead. I'm selling good mead for cheap... Black-Briar Mead. I sell cases of it for half of what the inns and taverns pay through the Meadery. All I need is someone to deliver it for me. If anyone saw me leave Riften, they'd get suspicious." 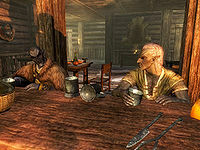 When asked to elaborate on the supposed delivery, he will say: "I need someone to take this small keg of Black-Briar Mead to Wilhelm at the Vilemyr Inn in Ivarstead. Drop it off and he'll trade you something for the delivery. Keep it as payment for the legwork. Oh, and if you bump into Indaryn from the meadery, keep your mouth shut. He'd rat us out in a second." At this point the quest Under the Table will show up in your journal, and you will have the option to either deliver the keg to Wilhelm or to tell Indaryn about Romlyn's undercover business. When you tell him, he will say: "Aye, I suspected as much but I've never been able to catch that little sneak with proof." When you show him the keg, he will get angry: "That fetcher! I gave him the same keg just this morning and told him to store it in the cellars. Oh, he'll rot in prison for this one I promise you. As soon as Maven finds out, it's all over for him. Here, take this as a bit of a reward for nabbing our little thief." He will then hand you some leveled jewelry, although Maven will never hear about the illegal mead-trade and Romlyn will remain an employee of the meadery indefinitely. Hand it over and no one has to know. (Persuade) Passed: "If word gets around that I bedded her, they'll lose all respect for me at the meadery. Take the mark if you want it. It's not worth all this hassle anyway." Give it to me or else! (Intimidate) Passed: "If word gets around that I bedded her, they'll lose all respect for me at the meadery. Take the mark if you want it. It's not worth all this hassle anyway." This page was last modified on 29 December 2018, at 21:07.